File image of Curry Village in Yosemite. Many South Bay students and parents are up in arms after school officials canceled a field trip to Yosemite. Cupertino Union School District officials said they were forced to cancel the week-long trip due to safety concerns. Last Sunday, a woman was killed when a Ponderosa pine crashed onto a tent-cabin in Half Dome Village, according to the San Jose Mercury News. "This is a decision that we did not take lightly as we know how much it means to our students, and to the members of our team who spend countless hours organizing it," Superintendent Wendy Gudalewicz said in a letter to sent to families. "Unfortunately, due to the extremely dangerous road conditions, and the death of an individual at the camp on Sunday, our organizing team has recommended that it is the best interest of student safety to cancel the trip." Students from Kennedy Middle School were on their way to Yosemite last week, but were forced to turn around after officials were alerted the children's safety was at risk. Cupertino Middle School and two other schools were also planning trips. The district made the announcement to cancel the trips during a meeting Wednesday. Some parents said they have been raising money since October and spent up to $1,000 for their students to attend the annual trip. Gudalewicz said the district is working to reimburse families. 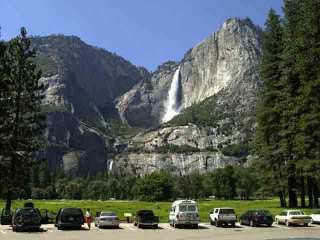 The Mercury News reports $1.34 million was raised by parents and supporters to finance this year's Yosemite trips.